Star Mackie starts a club, to help her make friends at a new school. The club turns into a poetry club and becomes a lifeline for her and some other students. But that's just the plot. Star is the kind of ten year old heroine we all love, she's bright, enthusiastic, empathetic and determined. She's also poor. Star lives in a trailer with her Mom and teenage sister, they use food stamps and her hair was cut by a family friend who needed some practice. This story is told from Star's perspective and her voice is written with incredible authenticity. As a result Star's family are drawn with differing levels of clarity, depending on how close she is to them or how well she understands them. I'm pretty sure that Mom's best friend is actually Mom's girlfriend, but that doesn't cross Star's mind. There's also a lot of ten year old thinking behind Star's actions, for example she does her homework, but she never hands it in, because her teacher expects that she hasn't done it. Of course Star is marginalized, bullied and pre-judged by students and teachers alike. Nevertheless, the hope and conviction felt by Star Mackie could fuel a rocket to the moon. That energy gives this book an appeal that could not be achieved by an otherwise earnest plea for recognition of child poverty. At the end, things are taking a turn for the worse in the trailer and although Star has found a friend she can rely on and has got over the idealization of her absent father, this is no happy ending. 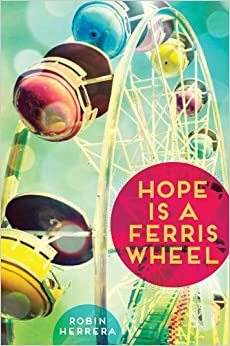 Hope is a Ferris Wheel raises some difficult questions and doesn't attempt to answer them. But because we now have the character of Star Mackie, we have springboard to discussion about social poverty. A difficult but really rewarding book that I imagine will be taught in schools in years to come.